Although earthquakes in New England have been rare, risks in the region are greater than previously known. Our main sponsor of earthquake investigations has been the U.S. Geological Survey (USGS), an agency in the Department of the Interior. The agency issued revised estimates of U.S. earthquake risks in 2014, explained in a scientific journal article published in 2015. Earthquake history: The most recent major earthquake in the region occurred 260 years ago: the Cape Ann earthquake of November, 1755. Its energy has been estimated at Richter magnitude 6.2, only a little less than the Northridge earthquake of 1994 that collapsed Interstate 5 through Santa Monica, CA. 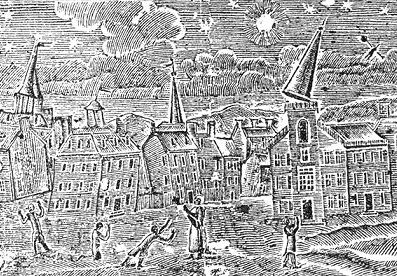 Hundreds of Boston chimneys shattered in 1755, church steeples toppled and walls of more than a dozen brick buildings collapsed. Damage from a similar earthquake today could be widespread and severe, given the area’s large inventory of unreinforced solid brick buildings from the 1920s and before on soft, waterlogged soils–found in much of the urban parts of Boston, Brookline and nearby communities. A strong earthquake could liquefy soft soils and jolt foundations. The main MIT campus, built over garbage and landfill, might be at major risk. Revised risk estimates: According to seismologist William Leith of USGS, “The  exposure estimate [of 143 million U.S. residents at risk from earthquakes] is nearly double the  estimate of 75 million….” Dr. Leith omitted to mention that an “at risk” criterion had been changed by the agency, a kind of mission creep. However, some of the 2014 risk estimates, as compared with previous estimates in 2006, represent real increases in recognized risks. Much of the recent evidence comes from monitoring and reanalysis of small earthquakes, frequently occurring in New England. The U.S. northeast shows five main clusters of increased risk recognition, the greatest south of the White Mountains of New Hampshire. 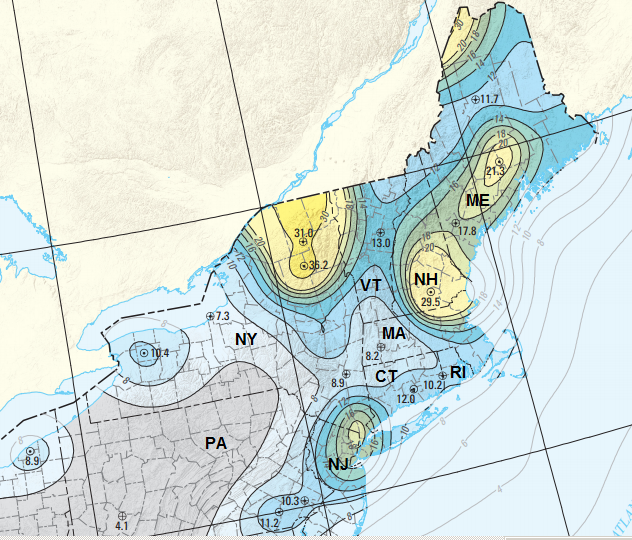 Earthquake risk changes, northeastern U.S. Despite improvements, distance intervals used with USGS earthquake risk estimation remain too coarse to reflect New England soils. Subsoil structure can change greatly in a mile or less. So far, New England governments have not tried to address those challenges of estimation. According to 2014 USGS analytical maps, risks in metropolitan Boston rapidly rise toward the north and fall toward the south. For urban Brookline and Boston, a 2014 USGS risk contour map shows a 2 percent risk in 50 years of an earthquake with about 0.15 g peak ground acceleration. That would be between 6 and 7 on the Mercalli scale of local intensity. By comparison, effects in Boston from the 1755 Cape Ann earthquake have been estimated at about Mercalli 8, an intensity currently predicted to occur around once per 700 years (that is, a more frequent event). Earthquake risk contours, northeastern U.S.
An apparent discrepancy in Boston-area risk estimates could come from local amplification of earthquake effects, owing to soil conditions and building techniques. Urban areas around Boston have risk factors that might be compared with Mexico City. Effects there of a September, 1985, earthquake were severe, although the magnitude 8 epicenter was about 250 miles west, near the Pacific coast. Risks in New England are significant but notably less than those near New Madrid, MO, and Charleston, SC–the eastern U.S. areas at highest risk. Three major earthquakes between December, 1811, and February, 1812–up to near magnitude 8 and centered in southeast Missouri, northeast Arkansas and westernmost Kentucky–were the strongest series in recorded U.S. history. New Madrid, MO, was largely destroyed in 1812. Ground shaking was noted in Boston, about 1,100 miles away. Seismic activity in the New Madrid area remains high. Investigations found similar, disastrous earthquakes had previously occurred nearby over recent millennia. Consequences: Potential consequences of 2014 USGS risk revisions in the Boston area, over several years, are changes to earthquake resistance codes for buildings and infrastructure. Unreinforced solid brick buildings could require total replacement after a strong earthquake. While most homeowner insurance policies exclude earthquake coverage, riders are usually available, but premiums may rise. The Earthquake Hazards Program at USGS has become a child of neglect. It has been funded at about the same amount for 2015, in dollars of the year, as for 1975–while general inflation eroded over three-quarters of the former purchasing power. Spending in the wake of a disaster does not help to prevent or reduce it. This entry was posted in Environment, History, Public health on October 14, 2015 by Craig Bolon.